Its been an amazing time with Blazecoin, developing the coin, expanding the capabilities of the foundation, meeting people from around the world who are interested in Blazecoin. And for many, you've already made a bunch of money off of trading Blazecoin. We are preparing for a live Q&A session for everyone to attend (with amazing prizes just for attending), but until that time I wanted to give you an update on Blazecoin voting. Why? The larger the exchange, the more traffic that will find the coin and the greater the chance for the community to grow to support the coin. Currently, Blazecoin is on two exchanges of note. C-CEX (https://c-cex.com/?p=blz-btc) and Coin-Swap (https://coin-swap.net/market/BLZ/BTC). On Coin-Swap Blazecoin has had several days where it was the highest traded volume coin and has consistantly ranked in the top 5 volume coins for the time it has been listed. On C-CEX there has been active traders, but there are other helpful factors with C-CEX. First, with C-CEX direct US Dollar and Blazecoin can be traded. Second, there is a built in merchant account system with payment verification that allows anyone to accept payment in Blazecoin (https://c-cex.com/?id=merch) and stay-tuned to a live webinar where I will demonstrate how to set this up. Only if the community votes for the coin can it get added to an exchange. So if you want Blazecoin on any of these exchanges... please vote. 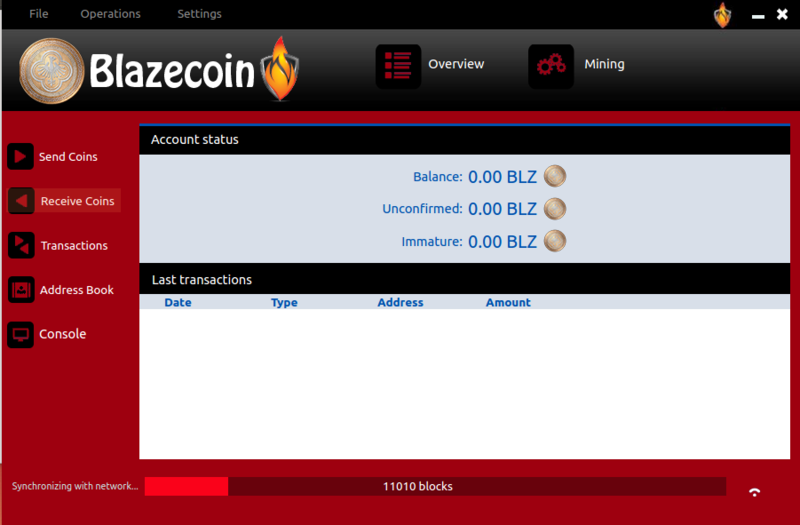 There is an awesome new update available for all Blazecoin users and miners. There was a TON of code behind the scenes happening over the past two weeks. And the results are now ready for everyone to enjoy. We will provide more information about the update tomorrow, but for now, check out a preview of the new Blazecoin wallet. Head over to the Coin Resources section to grab the downloads or compile the code (if you prefer the source). In the last post we took a look back on the first week of Blazecoin. In this post I wanted to talk about what steps are next for Blazecoin. Some of these steps are almost done and some are currently in the works. Let us know if there are things you would like to see happening with the coin either on Twitter or over on IRC. Getting listed on larger exchanges. This will happen once the "noise buzz" raises to a higher level. Releasing a "Mining for Beginners" and "Crypto/Digital Currency for Beginners" sections to the Blazeco.in Site. We will also be releasing these as ebooks on the Kindle and for download. We have several press interviews (radio/tv) scheduled for the North Dakota region. Why North Dakota? Because there are several volunteer fire departments that are struggling to keep up with the oil boom and Blazecoin is going to be supporting a fund drive for some of the stations. This will help drive traffic and new users to Blazecoin as well as oil money donations to the project. In the coming days I will be announcing a unique new interest-building investment plan with Blazecoin that will benefit the early adopter miners who are joining the community during these early stages. Several of these features will require updates to the source code as we proceed down the development roadmap. So please pay attention to the Twitter account, Official Site, and/or the IRC #blazecoin room so that you will have the latest information as soon as possible. We have a number of additional features, enhancements, and projects that are unannounced at this time but when we get closer to release we will make sure everyone knows. I thought I would take a moment to take a look back at what has gone on behind the scenes of the Blazecoin development cycle. Blazecoin launched very smoothly with initial miners gobbling up the first 100 blocks (which only had 13 coins in each). This was our attempt at making an even start for those that were available at the time of launch. As news spread people joined in and after the first 100 blocks were found, the block rewards returned to the current reward size of 413 coins per block. Blazecoin launched will a full featured website with everything needed to explain the inner workings of the coin. Windows, Mac, and Linux (github) wallets were available at launch. Multiple seed nodes were available at launch to make it as easy and fast as possible for people to join in the mining. An official mining pool was release on launch (http://mining.coreco.in) and will remain open and available for the life of the coin. 4 other pools joined the launch. A Blazecoin dice game was available at launch for any miners who were looking to have a little fun with their newly mined coins. A Blazecoin-PHP library was available on launch for anyone looking to build and integrate Blazecoin into web application was available in github. Some of the capabilities were demonstrated on the Blazecoin API site that keeps track of hashrate, difficulty, current block number and more. A full Blazecoin Block Explorer and a more Block Crawler were both available on launch. A day after launch the ability to print out Blazecoin Paper Wallets was made available. A day after the launch an entire social network for Blazecoin sprung up at station.blazeco.in that offered a simply way of sharing things that were going on in the Blazecoin community and to tip each other. I'd have to say its been a pretty busy few days. But we've got a ton of things in the works for the coin which I'm listing a roadmap in the next post. Why would you trust me? It is an honest question and one that should be asked a whole lot more than is currently being asked. How many times do the people in the crypto/digital currency world have to hear another story about how some developer ripped off the community, dumped their pre/instamine horde of coins, or suckered people into buying into a soon to be dead coin. This whole wild west world of the crypto currency attempts to build its foundation on anonymity and protecting the secrecy of the individual. This concept is a blazing petri dish waiting to easily grow the next scandal every single day. While I believe in the individual privacy of users of crypto/digital currency, I disagree that this "privilege" should be freely extended to the developers of such coin/currency. Because in order for a crypto/digital currency to succeed, however "decentralized" it is meant to be, all users need to be able to place their trust in the hands of someone/some group to watch over the integrity of the network and future viability of the crypto/digital currency. So I ask the question, how can anyone place their trust in someone who lives on an anonymous forum and goes by the name CryptoButtBomber or some variation? How can you trust a group to carry out the directives of the "coin" when you don’t even know who they are or anything about them? How can you trust someone to have the "betterment of the community" as their focus with zero track record to draw from? Have you ever asked a question of a crypto developer that follows along any of these lines? Is this the first coin you’ve ever worked on? What other coins have you been “involved in” not as a developer? Do you have other coins in the works at the same time? Have you ever debugged C++ code? Do you even know C++ code or just how to use Ctrl-C/Ctrl-V? Do you have examples of development and code work that you can point to that are outside of the crypto world? I would venture to say that most of us have never pursued any of these questions before jumping into bed with a developer’s coin. I venture to say that most miners in the crypto/digital world don’t even know if the main developer behind the coin is a real person or even know if they have a name beyond some anonymous forum handle. Have you ever tried to dig into the background information (registration, etc) of the domain names affiliated with the coin? Are they hidden? Are they protected from people finding out who actually owns the domain? Why? If the developer has nothing but the best intentions for a coin and the community around the coin, why the need for secrecy. If nefarious purposes are at the heart of the coin then I understand the need for a cloud of secrecy. Or if you live in a country where it might be dangerous to reveal personal information, I understand that… but be upfront about it. There are a number of coins that I can point to that have developers front and center (or at least available to talk). While they may not be blasting their information to the world, they are happy to sit down and talk with someone who has a interest in the coin/creation. So, would you trust someone who states that 1% premine of a coin that launched a week ago will be used for matching grants for volunteer fire departments? If that developer is upfront about who they are, where they are located, what other coin communities they have helped with, and even invites people to visit his fire station. I would say that there is a pretty strong foundation of trust being built. Remember, trust is earned and should not be freely given. John Lennon used to say "Being honest may not get you many friends but it’ll always get you the right ones." And that should be the foundation that builds the trust needed for any successful community, coin, and life. In my next update, I will share with you more about why the Blazecoin was created, what is the purpose of the volunteer fire department matching grant fund, how it will work, and what sort of incentives are being prepared to be rolled out to early adopters of the Blazecoin. The Blazecoin Station has opened its doors. You can learn more about the station on its informational page, but the crux of the idea is a place to talk about Blazecoin and share information and events related to Blazecoin. (a social network of sorts). Tipping of Blazecoin and an integrated web wallet are all part of the new STATION. The barrier of entry has gotten even lower. If people are familiar with Twitter or Facebook, they will feel right at home in the Blazecoin Station. Note: Web wallet security is in the final testing stages and will be released soon. Blazecoin joined the digital currency world with great fanfare and a smooth launch. At the launch all the necessary resources to begin mining operated without fail and a whole host of additional resources like PHP libraries, Block Crawlers, Block Explorer, Paper Wallets, Dice Games, and more opened from day 1. More information to come. Blazecoin-PHP Library - You can see it in action on the API site.